It turns out, there are oodles of sites on the web that offer the history of coffee. Just submit history of coffee in your favorite search engine, and you will be reading for days. Some of the stories relate the tale of a sheep herder from Caffa Ethopia named Kaldi who ate the red berries of the coffee plant as he tended his sheep. Since most agree that coffee was discovered before 1000 AD, I am not sure that Kaldi is so much the discoverer as a scapegoat. You take some coffee beans from a coffee plant. Roast them as desired. Grind them a lot or a little. Add hot water, ideally around 195 - 200 degrees F. Wait. Either filter to remove the grounds or leave them to settle to the bottom. Optionally add spices, milk product, sugar, etc. Drink. Smile. This method, which I refer to on this site as Turkish Coffee is popular in both the middle east and my house. It involves using extremely finely ground coffee boiled in water, typically with sugar. Some choose to add various spices to the coffee, such as cardamom. There is no straining nor filtering, the coffee, grounds and all, are poured into cups for an excellent drinking experience. The French press method is typically chosen by coffee tasters, as well as coffee snobs. It actually gives the maker a lot of control over the final product. Coarsely ground coffee is placed in a glass carafe. Hot water is added and a lid with a plunger is placed on top. After approximately 5 minutes, the plunger is pushed down, taking most of the grounds with it. The coffee is then immediately poured into cups. The French press can make a perfect cup of coffee. An excellent way to brew a single cup of coffee that is unique in many ways. The final product is often described as drinking a cup of melted coffee Häagen-Dazs ice cream. Made with condensed milk, it is great hot or served over ice for a summer drink. If you arent a hands on coffee person then you won't enjoy the Chemex. If you dont mind the hands on approach and want a superior drip brewing system, then you should consider the Chemex. A tutorial brought to us by MAS ... our guest coffee professor! One way to destroy a perfectly good coffee bean is to boil the grounds. Then keep boiling. Then boil some more. This is percolating and ends up with a thin and bitter drink. Obviously, this is not my cup of tea but there are those who, for some reason, like this result. Espresso is made when fine ground coffee is infused with hot water at high pressure for a short time. 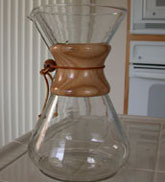 The resulting coffee is full bodied, strong flavored, and typically has a crema or foam on top. Combined with steamed milk for a latte or cappuccino, espresso is quickly becoming an American favorite. Vacuum brewing is definitely cool to watch. The method uses a device composed of two globes, one on top of the other, with a filter between them. Coffee grounds are placed in the upper globe, water in the lower. When heated, the water, due to pressure from the resulting steam, travels up a tube into the upper globe, mixing with the coffee. As the device is allowed to cool, the water (now coffee) filters into the lower globe. A mediocre cup of coffee usually ensues. Mr. Coffee, Bunn, Melitta, etc. We all know these devices all too well. When calibrated to the right temperature (as Bunn is known to do) the coffee is very good. Coffee grounds, a medium grind, are placed in a basket with a filter. Hot water drips into the basket, over the grounds, through the filter and into the carafe. Most paper filters actually are part of the problem and can be replaced by a gold mesh filter, which, if properly cleaned, works very well. 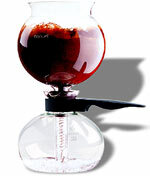 An auto drip system can make a wonderful cup of coffee, too often it does not. This is similar to the way some people make tea (why anyone drinks tea ... well this is a coffee site). 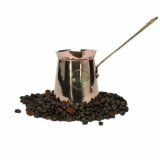 A relatively large amount of coarsely ground coffee is brewed in a small amount of either hot or cold water. If cold, the brewing sits overnight. The brew is typically filtered. When desired, hot or cold water is added to some concentrate and the result is a mild drink with minimal acidity. There are those who would argue that instant coffee does not belong on this site. Although they are probably correct, since my dad drinks it when he is not at my home, well, I have to include it. Prepared instantly, just add hot water to a spoonful of the unknown granules for a simple, albeit weak, cup of coffee. Hey, it works, and is probably the best our troops get in the field, so we must support it!